DAR members are pictured at the George Washington Historical Marker. 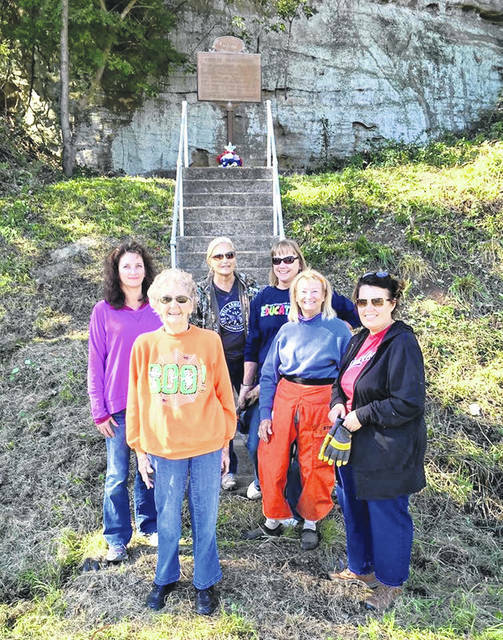 LONG BOTTOM — The members of Return Jonathan Meigs Chapter of DAR recently cleaned the George Washington Marker located on State Route 124 near Long Bottom, Ohio. The marker previously had been installed there in 1932 by the DAR. George Washington made his trip down the Ohio River there in 1770 and was accompanied by his Indian Guide Kiashuta. The leaders and their parties camped there overnight. The members of DAR have faithfully kept this Memorial cleaned since it was erected in his honor.